In the Age of Terrorism, the United States has become a much more dangerous place—for activists and dissenters, whose First Amendment rights are all too frequently abridged by the government. In Hell No, the Center for Constitutional Rights, the country’s leading public interest law organization, offers a timely report on government attacks on dissent and protest in the United States, along with a readable and essential guide for activists, teachers, grandmothers, and anyone else who wants to oppose government policies and actions. 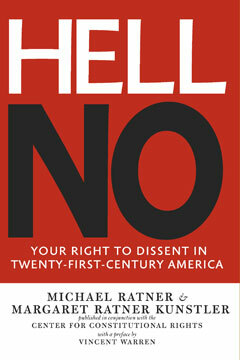 Hell No explores the current situation of attacks upon and criminalization of dissent and protest, from the surveillance of activists to the disruption of demonstrations, from the labeling of protesters as “terrorists” to the jailing of those the government claims are giving “material support” to its perceived enemies. Offering detailed, hands-on advice on everything from “Sneak and Peak” searches to “Can the Government Monitor My Text Messages?” and what to do “If an Agent Knocks,” Hell No lays out several key responses that every person should know in order to protect themselves from government surveillance and interference with their rights. Beginning with a preface by Vincent Warren, executive director of the Center for Constitutional Rights and a frequent legal commentator on CNN, MSNBC, and NPR, Hell No also includes an introduction on the state of dissent today by CCR board chair Michael Ratner and Margaret Ratner Kunstler. Concluding with the controversial 2008 Mukasey FBI Guidelines, which currently regulate the government’s domestic response to dissent, Hell No is an indispensable tool in the effort to give free speech and protest meaning in a post–9/11 world.